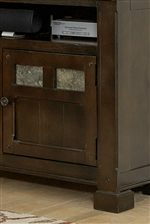 Fit for a getaway home or just the feel of one, this 54-inch TV console offers rustic beauty. Nautral slate accents add a pop of color to the beadboard doors. A large top compartment will accommodate a sound bar. You TV set up will be perfect for relaxing and hosting friends and family with this TV stand. The Telluride 54" Console with Slate Accents by Progressive Furniture at AHFA in the area. Product availability may vary. Contact us for the most current availability on this product. The Telluride collection is a great option if you are looking for Casual furniture in the area. Browse other items in the Telluride collection from AHFA in the area.